Vikings-49ers Preview: Ready for Some Football?! The name San Francisco 49ers conjures up images of Joe Montana hitting Jerry Rice in stride for a touchdown—and Super Bowl trophies. If you’re younger than me, you might think of coach Jim Harbaugh berating a replacement ref. But the Vikings play neither one of those teams on Monday night. They play a completely new Niners squad that we know little about. The Vikings travel to the “city by the bay” for the Monday Night Football opening weekend nightcap. They play a team that is not your grandfather’s, your father’s or even your 49ers, as the team has gone through a major renovation since last season. Former head coach Harbaugh is gone, after taking his team to the playoffs for three of his four seasons, and a number of the players from his 2014 team have either retired, left via free agency, were traded or suspended. The Niners have lost 12 players who started at least six games last season. But it’s not about who is gone (RB Frank Gore, G Mike Iupati and WR Michael Crabtree, among others), it’s about who is there. And it starts with head coach Jim Tomsula and the new players he brought in, including former Baltimore Ravens wide receiver Torrey Smith, former Detroit Lions running back Reggie Bush and former Arizona defensive tackle Darnell Dockett--who is confident that the Niners will be tough this season. The Vikings certainly won’t be taking the Niners lightly, despite the fact that they are undergoing a sudden rebuilding. Underestimating any team in the NFL, especially on the road, is the way a favored team (Vikings by 2.5), can get beat. It’s particularly true at the beginning of the season in front of a crowd that’s been prepping all day for MNF. “Well, the first game of the season is always a challenge,” offensive coordinator Norv Turner said when asked about the Niners. “I thought they played well in the preseason. I thought they were very sound, did not give a lot of big plays. So we are going to have to prepare for what we are looking at on tape. The Vikings travel to San Francisco with a few personnel questions of their own—particularly on the offensive line. The unit’s leader John Sullivan underwent back surgery last week and has been placed on the IR/designated for return list, which will have him scheduled to return for week nine at the earliest. Joe Berger, who was a key signing by the Vikings in the offseason, will take over for Sullivan and he joins rookie T.J. Clemmings at right tackle and right guard Mike Harris as new faces starting on the offensive line. With Brandon Fusco moving from right guard to left guard and Matt Kalil coming off two offseason knee surgeries, it is anyone’s guess what we will see from this unit. It may not be the ideal line to run behind for the returning Adrian Peterson—who is somewhat of a question mark in his own right. But Peterson is not a question mark to his quarterback Teddy Bridgewater, who will play his first game with Peterson in the backfield. “Oh man, you can just feel his presence from the moment he walks into this facility that he’s ready to play,” Bridgewater said of Peterson. “He’s had an entire year off and we’re excited for him. We can’t wait to watch him running wild on Monday. Now might be the time when we bring up the Vikings’ record with San Francisco, Peterson’s success against the team or how Mike Zimmer-coached defenses do against them. But in my estimation, those kinds of things are meaningless since each year the teams change, and they mean even less when after San Francisco’s makeover. So we won’t bring those things up. We will just say that the Niners still have Colin Kaepernick at quarterback, who is a threat with his feet as well as his arm. There still have a solid tight end in Vernon Davis, who could just as well play wide receiver. And they have a tough wide receiver in Anquan Boldin, who could just as well play tight end. They will present match-up concerns on defense. The Niners will pass the ball often, but they may try to test out the Vikings rushing defense, which was down last year, to see if it has improved. Carlos Hyde will be the main back, but Bush will bring his brand of rushing and receiving expertise into the mix. Though quickly reformatted since last season, the 49ers still present a tough test for the Vikings. It’s a crapshoot picking games and outcomes in the first week of a regular season. But there will be a couple things to count on: expect to see Peterson run with some emotion. Expect him to see him hit the hundred-yard mark, as a nation will be watching. Expect him to catch some passes out of the backfield. Just don’t expect him to get the ball on the first play of scrimmage. San Francisco will be looking for that. Be sure to join the conversation in the game thread at Vikings Journal! 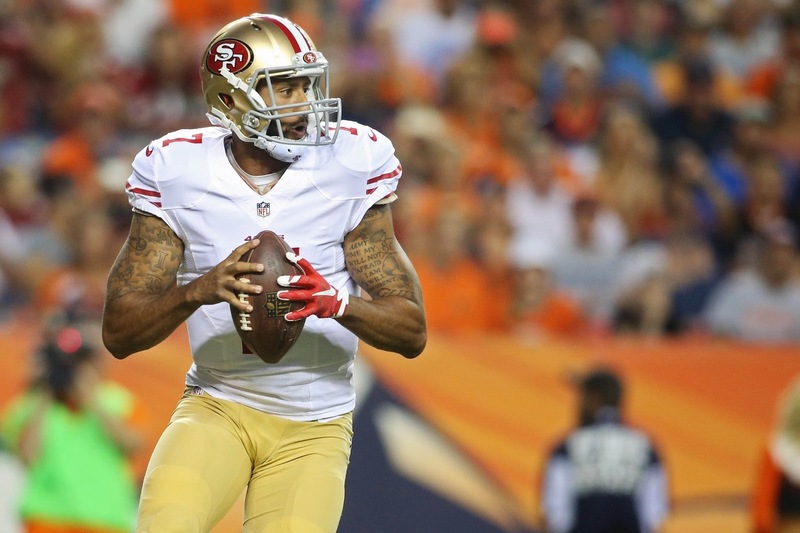 → Article: Vikings-49ers Preview: Ready for Some Football? !